Silver white winters have finally melted, paving the path for spring to blossom. You know what this means, right? It’s time for long sunny days in the sun, lazy countryside picnics, beach trips and barbeques in the backyard. However, things are not so bright and gay all the time. Spring also is the harbinger of pests who prowl about our gardens, nesting, mating and breeding on our property like they own the damn place! Now, there’s nothing to worry about an occasional bee or wasp in the garden. But if you notice a huge swarm of stingy insects swarming, you might have a pest problem. 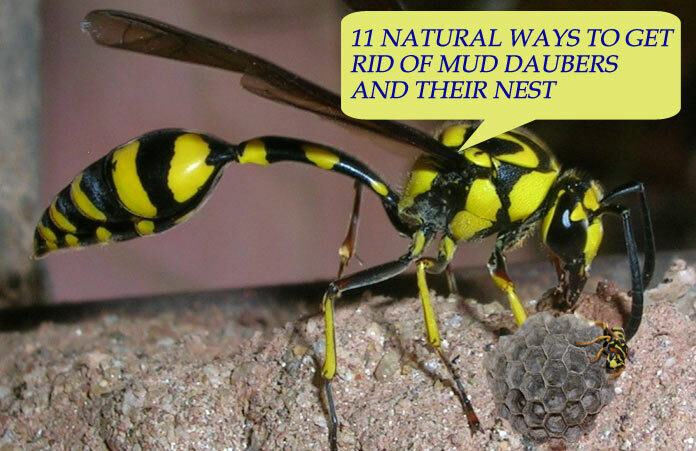 Here are some of the best home remedies to control the mud daubers wasps naturally. Is it a Wasp or a Bee? 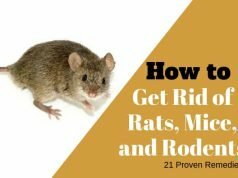 It is imperative that you identify the pest correctly before taking any action against it. Wasps and bees look almost identical from a distance. However, they are similar only on the surface. Honeybees have to be dealt with differently; most states have banned the killing of bees as they’re beneficial for the environment and endangered. Wasps, on the other hand, are a lot more aggressive if provoked. Some species of wasps are particularly volatile and tend to attack in swarms. Lucky for you mud daubers don’t belong to that category. They are solitary insects that prefer to stay away from humans. Wasps don’t usually attack humans unless provoked. However, unlike bees, wasps are of a more volatile temperament and hence more likely to get pissed off at the slightest disturbance. The mud daubers are an exception, as it prefers to stay out of trouble. They build their nests in the mud and prey on spiders, keeping away from humans unless deliberately aggravated. These stinging insects are actually good for your garden as they keep all the other insects away. How to keep the Mud Dauber Away? Mud dauber wasps are seemingly harmless and docile creatures. However, it doesn’t mean you keep a yellow mud dauber in the house! Here are some simple and effective natural home remedies to eliminate the dirt dauber nests. Peppermint oil is the ultimate wasp repellent that you can use to drive the mud daubers away. Just pour a few drops of peppermint extract on the infested area and watch as the stingers run for their lives. Wasps, or any insect for that matter, can’t tolerate the strong smell of peppermint. The remedy is effective for clearing out large nests and wasp burrows that stretch to the remote corners of the house. You can use cinnamon oil or essential oils like lavender, tea tree or chamomile as well to chase the creatures away. Why spend money on getting special ingredients and sprays when you can prepare a wasp repellent with items from your kitchen? All you need is water, dishwashing soap, and a spray bottle. Add a few drops of liquid soap to lukewarm water, stir the solution and pour it into a spray bottle. Spray the mixture generously over the infestation. You can even pour it down the holes and mud burrows. Soap water washes down the wasps away and also softens the mud burrows for easy cleaning. The pesticides and over the counter bug sprays contain harmful chemicals that can pollute and poison the garden soil. A better, safer alternative would be to pour boiling water over the nesting area. It is an effective way of killing the wasps and washing their nests away. This might seem very inhuman to some readers as the creatures die a painful death, but if it’s any consolation, they die quick. The best time to attack the wasps would be at night when they are sleeping. Taken by surprise, the wasps will die without a fight. If you want to curb the wasp population in an eco-friendly way we suggest you use the organic or eco-friendly ones. Citrus oil extracts, for instance, are powerful botanical insecticides that kill the wasps without harming the garden soil. Citrus oil is rich in limonene and linalool, pigments that burn the wasp’s bodies and kill them almost immediately. Keep a bottle of citrus oil handy whenever you’re passing through the infested area, you never know when you might need to defend yourself from a wasp attack (1). There are two kinds of wasp traps you can make in your home – the water trap and the glass trap. The water trap requires a half-cut plastic bottle and some jam. Fill the bottle with water, smear some jam on the rims, place the top half of the bottle on it upside down and you’re set. The wasps would slide down the funnel to get to the jam but would be unable to find their way back up. The glass trap is sturdier and far more effective though. Buy a colorful glass trap, fill it with sweetened water and hang it in the infested area. The wasps, lured by the sweetened water, would fly in through the hole only to be trapped inside the structure. Wasps, especially the mud daubers are very territorial. They are always on the lookout for abandoned spots and quiet corners to encroach and nest upon. If they find that your garden is already occupied by other colonies, chances are they won’t consider your property for nesting. You can easily get a fake nest from the market or build one yourself. Build small cylindrical burrows in the ground and cover them with mud, these mounds resemble the dirt wasp tubes. Powdered deterrents like diatomaceous earth, talcum powder or boric acid work wonders in clearing out the ground wasps away for good. DE or diatomaceous earth contains eugenol(2) that absorbs the moisture and wax coating on their bodies leaving them vulnerable to external attack. Sprinkle some DE or another powdered deterrent on the nesting area, the results are almost instantaneous. After the mud wasps have escaped the nests or killed inside, seal the opening with peppermint oil, this would keep the other insects off the inhabited area. Smoking out the wasps is a good way of killing the creatures in one go. The other wasps build their nests in high spaces, unlike the mud daubers. To remove the daubers, you need to burn their burrows and wasp tubes. You can burn a piece of paper or cloth and use the smoke to drive the wasps away. You can even light a fire in the grill and place it below the nest in case the daubers have infested a slightly elevated location. Cover your eyes and mouth before you undertake the task. This is the perfect solution for people who do not want a bloodbath in their backyard. Wasps, though notorious, are essential for the environment. Relocating the nests might not be as cruel as some of the other remedies suggested here, but it sure is among the most dangerous of the lot. We suggest you hire a professional or take the necessary precaution before trying this method. Approach the nest in the dark when the wasps are sleeping, gently transfer the nest from the ground to a cardboard box and then drop it off at a safe place far away. The landscape of your property plays a major role in attracting or deterring pests from entering your home. An easy way to get rid of black and yellow wasps would be to grow plants that repel the pests. For this, we suggest that you grow some wasp repellent plants and trees around the house. By keeping thick foliage of plants like eucalyptus, wormwood, spearmint, thyme or citronella, you keep the wasps, bees or hornets far away from your house. And the fact that these trees are aesthetically appealing is but an added bonus. Wasps, especially mud daubers are notorious for choosing the narrowest, most unreachable corners to nest. 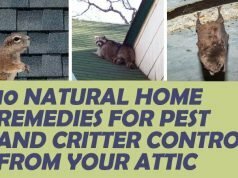 Often times, you’d spot their nests in window cracks, up on the ceiling, inside the floorboards or even in-between kitchen tiles. In such a case, no amount of pesticides would be effective in curbing their population. What you need is a solution that destroys their nesting areas and drives the wasps out of their hiding places. Add 3-4 tsp of hot pepper or chili powder to a gallon of soapy water. Let the mixture simmer for a while before you pour it in the corners where the wasps reside. Mud daubers, though very docile, still have stingers that can hurt you real bad. They don’t usually attack humans unless you deliberately try to destroy their nests. Most of the natural remedies mentioned above the place you directly in front of the insect. It can attack you anytime as an act of defense. Therefore it is imperative that you take a few precautionary measures to prevent getting stung. Implement your wasp control tricks at night, use a tinted shield or dim light to not provoke them. You don’t always have to kill the wasps that have inhabited your property. 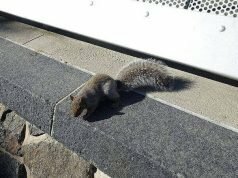 In most cases, you can learn to coexist with them provided you keep a safe distance from them. Wasps prefer to build their nests in peaceful and quiet corners of the house, far away from humans. However, if you find a wasp nest in the vicinity of the house, we suggest you remove or relocate it immediately.